What is the #thinksocial society? A community for like-minded entrepreneurs aiming for a positive social presence! The #ThinkSocial Society is your home for everything related to social media presence. Here, you will join an entire community of passionate and motivated entrepreneurs who want to be accountable to using social media in their businesses to its full potential. You will gain access to: daily, weekly, and monthly inspiration; helpful tips; and training from social coach Desiree Rose, along with so much more! The best social media hacks to grow your platforms, nail engagement, and build connections with your tribe. Is staying accountable to your social media a challenge? We get it. Join interactive threads every day to get back in the game! Learn from the best! Social Coach Desiree Rose shares her experience and wisdom about all things social-media. Bonus graphics provided monthly, created just for this community by the #ThinkSocial team! Hour-long, intensive training every month. Each month we will focus on a particular theme regarding social media. Feeling lost? Need Support? Struggling with Engagement? We are Your Tribe! It’s no secret that social media is where it’s at these days. Everyone and their dog (literally) has a profile on at least one social media platform, and most of us dip into three or four or ten more. Facebook? Yep. Instagram? You bet! Twitter? Pinterest? LinkedIn? Yes, yes, yes. Are you overwhelmed yet? Everyone uses social media these days, and it can be a pretty huge challenge to figure it out on your own. There is so much going on in the online world that it’s easy to feel overwhelmed and lost. You’re not alone, though. I’m here to hang out with you, walk you through the process, and share my experience. And I have a pretty awesome team who is here for you too! Even more amazing than that are the OTHER people here. People just like you, who own their own small business or are a Direct Sales Consultant. These people aren’t your competition, they are your friends and accountability partners! We are all in this together, supporting each other and rooting for one another! Are you struggling to do it all? Do you have everything in place but are still floundering, unsure how to keep it up? Do you just need some moral support in your small business journey? 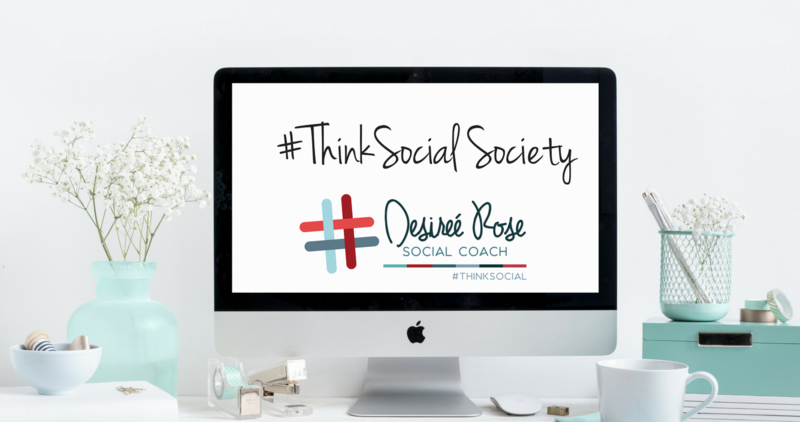 Join the #ThinkSocial Society RIGHT NOW! Don’t wait another day to increase your Social Media success! Join other motivated entrepreneurs who are ROCKING their Social Media in the #ThinkSocial Society today. Here you will find community and support, along with daily business building tips, weekly Q & A’s with Social Coach Desiree, and help with Instagram, Facebook, and Pinterest!